It’s the middle of peach season, and China has some of the juiciest and sweetest peaches in the world. Here, they are called 水蜜桃 (shui mi tao), or “water honey peaches.” As a peach lover, I find them to be irresistible, but a traumatic experience a couple of years ago has deterred me from messing with them since. This past weekend, though, I gave in. I wanted to bake, and I knew what I wanted (a peach). 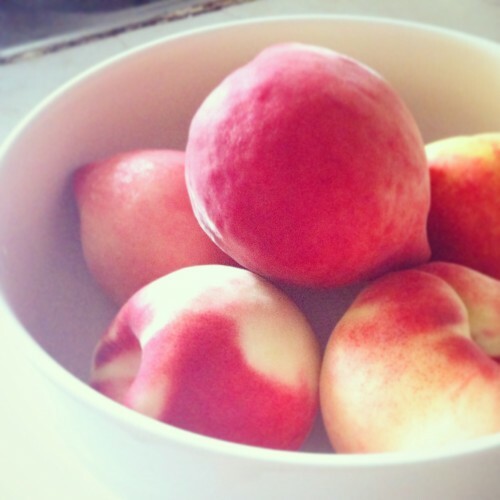 I marched to the market and carefully inspected each peach for wormholes and, despite it being near noon on a weekend, managed to come home with six quality peaches. This half-dozen peaches cost 3.8 yuan (about 62 cents). Score! With trepidation and Boyfriend’s help, I sliced them all up for a peach cobbler. 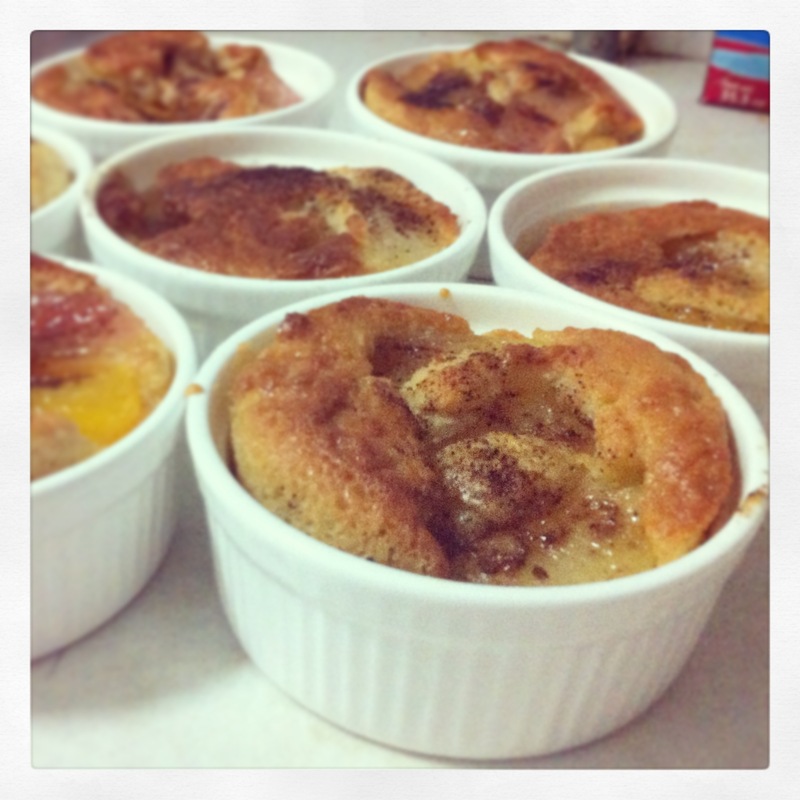 Or eight mini peach cobblers, if you will. The recipe comes from Paula Deen (don’t judge me!) — it requires just the most basic ingredients and tools, which is great when trying to bake Western food in China, but it doesn’t skimp on flavor or texture. It is insanely delicious for such little work. Just cut down on the sugar. I wasn’t completely rid of my baking bug, though. While I was at the market buying peaches, I had spotted some delicious-looking purple plums, which I love even more than peaches. And I remembered I had come across a recipe involving plums recently! So the next day, I checked out the fruit stand near my office and managed to find the most perfect plums for this torte. They were soft and ripe, squishy to the touch, but not to the point where they were too fragile to handle. That night, I made the best cake I’ve ever tasted with them. The torte, like the cobbler, is minimalist — just flour, butter, sugar and eggs, top with plums, sprinkle with cinnamon — and out comes a version of heaven so perfectly balanced between sweet and tart, juicy and crumbly, and with a kick of spice. The recipe calls for a 9-inch pan, but I only have an 8-inch, so my torte came out more like a cake. 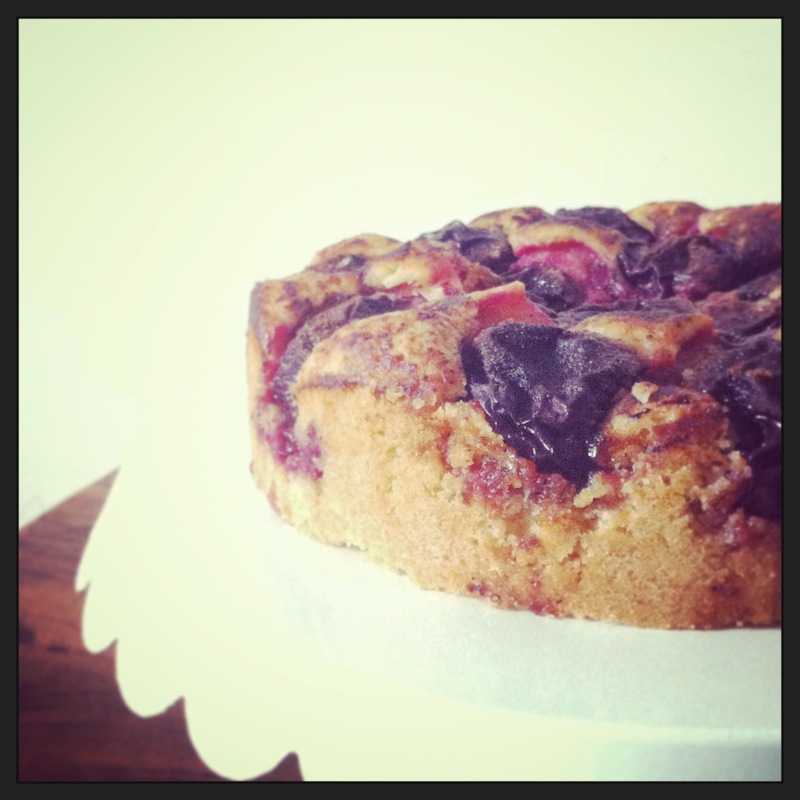 I can just imagine a thinner torte with plum juices seeping all the way down into the cake. It’s making me drool. I have to get a 9-inch pan.